Baseball requires a different level of discipline than other sports. Baseball combines athleticism and brain power. Baseball matters because it has shaped our culture and our kids for decades. It is a part of our history. Years ago I read the book A Reasonable Life: Toward a Simpler, Secure, More Sane Existence by Ference Matte. In this book, Matte laments the loss of simple pleasures, among them baseball. He compares the joys of a Sunday afternoon pick-up game to the intense, high stakes sport that kids play today. Maybe he has a point, but as the mother of a boy playing intense, high stakes baseball, I can tell you that it is anything but a joyless sport. My son loves the game and everything that goes with it -- long practices, weekends away, the fierce competition. Still, I wonder if he will still be playing five years from now. I wonder if he'll have anyone to play with. Apparently, baseball is dying or at least significantly declining. According to this article by Mark Fisher in the Washington Post, Rob Manfred, the commissioner of Major League Baseball, has concerns about the sport's decreasing appeal to young people. The article points out that MLB viewers are the oldest of any sport, with 50 percent being over the age of 50. And for the first time ever there were no baseball players among ESPN's 2015 list of favorite athletes. Perhaps most telling, is the fact that over the last 12 years the number of kids participating in Little League Baseball has dropped sharply, causing many towns to resort to multi-city teams and leagues. With the sport losing popularity, it's no wonder that some Little League teams and high schools are struggling to recruit enough players. Buy why? Why is America's favorite sport losing ground with American kids? Baseball is too slow for a generation of kids raised on TV and video games. As Fisher points out, baseball involves a lot of waiting. Waiting for a turn to bat. Waiting in the outfield for the ball to come your way. Waiting for someone to finally hit the ball or to strike out. Baseball is also a thinking game. In some ways it requires more patience and concentration than football or basketball. There's less hustle and more calculation. For kids used to instant entertainment and near constant stimulation, baseball can seem boring. It's expensive to play baseball. There is growing pressure for kids to specialize. As I mentioned, my son is on a high stakes team. He loves it. We love it. But if I'm being honest, I have to admit that we are part of the problem. It can be a significant financial burden for parents to have a child play on a traveling team. There's the expense of travel and time away from work. That eliminates some kids who might otherwise play. And traveling teams have a longer season than city league teams -- some even play year round. So the boys on these teams naturally get in a lot more practice. 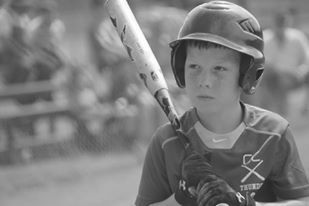 When summer rolls around again, some kids' only experience with the game is getting clobbered by teams who play several months out of the year. For these kids, soon baseball just isn't that fun anymore. Kids from single parent homes are far less likely to play baseball. According Fisher's article, a recent study by David Ogden at the University of Nebraska found that 95 percent of all college baseball players come from two parent homes. That is a remarkable statistic, but the logic is simple. Boys learn to love and play baseball from their dads. Not only that, but considering the substantial financial and time commitment that the game often requires, many single parent homes likely find it difficult to manage the sport. Baseball is a humble sport. In addition to the other strikes against baseball (pun intended), Fisher makes the point that baseball has far fewer big time celebrity players than football or basketball. That's because the nature of the game does not lend itself to show stealing or cockiness. Thanks to big money endorsement deals and massive fan followings, young boys are more likely to be drawn to flashier, more in-your-face sports. The way kids play has changed. It's easy to blame video games, but the way kids play has changed for a lot of reason. The days of The Sandlot are over. Parents today are far less likely to send kids out into the neighborhood to play unsupervised for hours on end. And school recesses are much shorter and more controlled than ever before. It might be possible in twenty minutes for kids to run a few football plays or a play a quick game of basketball. But it's not likely that they will have enough time to organize and execute even one inning of baseball. So, what does it matter? Unless you are a rabid baseball fan, who really cares if the game continues to attract kids and be America's favorite sport? It matters because even those who aren't fans of the game admit that baseball is a great sport. Baseball requires a different level of discipline than other sports. Baseball combines athleticism and brain power. Baseball matters because it has shaped our culture and our kids for decades. It is a part of our history. But mostly it matters because, as a friend of mine who has coached the game pointed out, baseball is a microcosm of America. The things that affect baseball -- money, the family, values, and how kids spend their time -- are things that affect us all. This post originally appeared on Charming Farming.